Trump confounded most expectations in 2016 by taking Florida, Iowa, and Ohio — all Blue since 2004 — and nudging two long-time Blue States — Michigan and Pennsylvania — into the Red column. Are Democrat spinmeisters or the mainstream media (pardon the redundancy) correct in believing that Roy Moore’s loss in Alabama means that 2018 will see a “Blue Wave”, in which Democrats retake one or both houses of Congress? Wasn’t Moore’s loss a continuation of the Dems’ “stunning” sweep of statewide offices in Virginia? Doesn’t all of that portend a repudiation of Trump in 2020? The answers are “no”, “no”, and “no”. Moore’s loss was a one-off event that had everything to do with Roy Moore and nothing to do with the political leanings of Alabamans. It is ludicrous to believe that Alabama has suddenly become a Purple State when Trump’s 64-percent share of the two-party vote surpassed the share received by any GOP candidate since Richard Nixon in 1972. The 2018 elections will hinge manly on how voters feel about what the GOP-controlled Congress has done for them. And by election day 2018, most of them will be feeling a lot better because the government is taking a lot less from their paychecks. Continued revival of the economy will also help to buoy voters’ spirits. Unless something very bad happens between now and election day, a pro-incumbent mood will sweep most of the land. There will be exceptions, of course, as this or that Representative or Senator is exposed as a philanderer, swindler, or something else unseemly. But those exceptions tend to affect Democrats just as much as Republicans. What is actually happening, in the grand scheme of things? A naive forecast of the 2016 presidential election, based on State-by-State trends between 2008 and 2012, produces 245 electoral votes for Trump. The naive forecast doesn’t predict a Trump win in any State that he lost. Moreover, it under-predicts the extent of the pro-GOP movement in Iowa, Michigan, Ohio, and Pennsylvania — States that Trump won, and the electoral votes of which put Trump over the top. 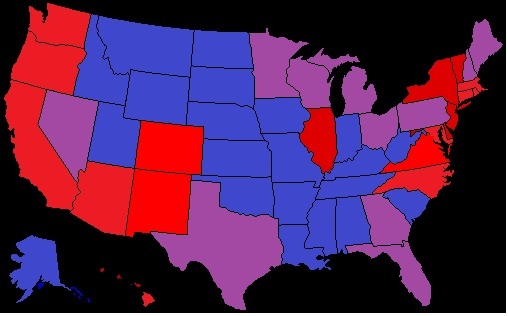 A naive forecast of the 2020 outcome, based on State-by-State trends from 2008 through 2016, produces 329 electoral votes for the GOP candidate. Iowa, Michigan, Ohio, and Pennsylvania will be joined by Maine, Minnesota, Nevada, and New Hampshire as Red States. As an old saying (of mine) goes, trends are made to be broken. But the betting here is that the 2018 and 2020 elections are the Republicans’ to lose. The first graph covers 10 States that were Red in 2000 and have led the way in becoming Redder since then. Note that all 10 have rebounded from the Obama effect in 2008, which was the occasion of temporary insanity among many voters who usually pull the lever for GOP candidates. The second graph covers the 10 States that have led the way in turning Blue or Bluer since 2000. You will note that even among some of these States Obama-mania shows signs of wearing off. Only California and DC seem determined to plunge deeper into political madness. California, by the way, more than accounts for Clinton’s popular-vote “victory” over Trump. (Clinton won California by 4.3 million votes, as against her meaningless nationwide margin of 2.9 million votes.) This is further proof, if proof were needed, of the Framers’ wisdom in creating the Electoral College. It is also a big point in favor of my fearless forecast for 2020. My algorithms, adjusted for the results of 2016’s general elections, are given in the following graphs. The gray lines mark the upper and lower bounds of the 95-percent confidence intervals around each of the regression lines. Before this year’s election, there was a slight Republican advantage; that is, a GOP candidate could expect to win slightly more than 50 percent of the electoral vote with slightly less than 50 percent of the popular vote. That edge was due mainly to George W. Bush’s narrow win in 2000 (a bare majority of electoral votes based on 49.7 percent of the two-party popular vote). Trump’s victory — 57 percent of electoral votes with 48.9 percent of the two-party popular popular vote — pushed the regression line upward and to the left. In the graph above, the unlabeled point just below the point for 2000 is the result for 2016. (Excel refused to add the label — perhaps reflecting the politics of Microsoft.) The fairly wide range of uncertainty around the regression line (plus or minus 7 percent) supports the old saw that all politics are local. The graph below shows a similar range of uncertainty about the results of Senate races, which — if anything — are more idiosyncratic than House races. If you estimate or guess that the Republican candidate will win 55 percent of the two-party popular vote, it’s a good bet that he will win somewhere around 78 percent of electoral votes (from the equation in the first graph). That’s 420 electoral votes (0.78 x 538) for the Republican, leaving 118 for the Democrat (538 – 420). If the Republican candidate gets 55 percent of the two-party popular vote, the GOP will add about 2.3 percent to the number of House seats that it holds (from the equation in the second graph). If the GOP starts with 240 seats, that number will rise by 5 (after rounding) to 245, leaving 190 for the Democrats (435 – 245). A Republican gain of 2.3 percent in the House means approximately no gain in the Senate (from the equation in the third graph). If the GOP starts with 52 of the 100 Senate seats, it keeps that number, leaving 48 for Democrats (including “independents” who caucus with Democrats). Those are baseline estimates, around which there’s some degree of uncertainty, which you can estimate by referring to the gray lines that delineate the 95-percent confidence intervals. Start tracking the polling results around August 1, or after the major-party conventions and related “bounces.” In the case of FiveThirtyEight, follow the link and scroll down to “How the forecast has changed” and select “Popular vote.” By hovering your cursor over the graphic, you’ll get daily estimates of the popular-vote shares of the Republican and Democrat candidates and the leading third-party candidate, if there is one. This year, FiveThiryEight kept tabs on Gary Johnson’s poll numbers. Set up an Excel spreadsheet and keep a daily tally of the numbers posted for each candidate. While you’re at it, also keep track of “other” by finding the difference between the totals for the named candidates and 100 percent. This year, that meant subtracting the Clinton, Trump, and Johnson shares from 100 percent. Also compute the daily spread between the Democrat and Republican candidate. For the sake of this illustration, I’ll use a Republican minus Democrat (R-D) spread. When you have enough observations — 15 or 20, say — run an Excel regression with R-D as the dependent variable. The explanatory variable(s) is (are) the shares going to candidate(s) other than the Democrat or Republican. This yields an estimate of how the R-D spread changes as voter shift away or toward from other choices. It’s a way of finding “shy” voters who don’t want to admit that they favor one of the major candidates, and it’s a way of detecting which major candidate stands to gain (or lose) the most as undecided voters make up their minds. How do you know what values to enter for the shares of the third-party and/or other candidates? Create a graph of the daily share(s) and add trend line(s) to it, projecting them out to election day. You can then choose the projected value(s) on election day, the most recent value(s), or your best guess(es). The regression yields an estimate of the R-D spread, as a function of the explanatory variable(s). Divide the resulting estimate of the R-D spread by 2 and add the result to 50 percent (or subtract it from 50 percent if it’s negative), which gives the Republican candidate’s projected share of the two-party vote. Keep updating the poll numbers, running the regressions, and plugging in your estimates of the values of the explanatory variable(s) until you’re confident of your results. I wasn’t confident until the day before election day because of the late shifts in polling results due to the FBI’s on-again, off-again investigation of Clinton’s e-mails. whether a presidential candidate is likely to do worse than normal because she (I’m thinking of Clinton) is generally viewed unfavorably. Got it? If not, leave a comment or e-mail me (instructions in the sidebar), and I try to make it clearer.